The European veteran makes into the league of the big boys. SAN ANTONIO – The San Antonio Spurs today announced they have signed Derrick Byars from the Bakersfield Jam of the NBA Development League for the remainder of the 2011-12 season. Per club policy details of the contract were not released. 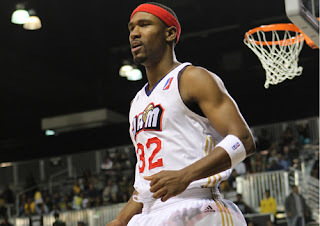 Byars, a 2009 D-League All-Star, has played in 104 D-League games, averaging 17.1 points, 5.1 rebounds, 2.4 assists and 1.00 steals in 35.3 minutes. This season, Byars appeared in two preseason contests with the Miami Heat averaging 7.5 points and 1.0 rebounds in 9.0 minutes. Byars has also participated in NBA training camps with the Chicago Bulls, Oklahoma City Thunder and Philadelphia 76ers. He has also played professionally in Greece, France and Germany. Byars split his collegiate career between the University of Virginia (2002-04) and Vanderbilt University (2005-07). As a senior he was named SEC Player of the Year after averaging 17.0 points, 4.9 rebounds and 3.4 assists in 34 games for the Commodores.